Here is my card for this week's MMSC74 sketch. 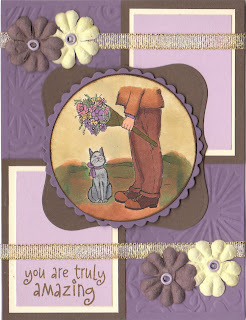 I used the "Man with Flowers" digital stamp set from the Priscilla Styles Store. I printed it out of vanilla card stock and colored it in with a variety of Copic Markers. I used the colors for the color throwdown challenge as well. I didn't have any Espresso, so I found a dark brown that matched as well as I could get. I added a bit of Pale Plum just for some contrast with the darker colors. The image was mounted on a circle with scallop circle Nestabilities and also Label 1 Nestabilites. The sentiment is from Hero Arts. I added the gold ribbon and the flowers and completed the card. Before I go, I also wanted to tell you about the give-away over at Paper Craft Star. They are giving away a $25 gift certificate to PTI! Yippee!! Make sure you hop on over there and read all about it!! I just love the way you colored this image. Wonderful colors and design. Awesome card. Very pretty! I just love the colors you used. Dori you have created a marvelous creation with this "priscillastyles" image. The colors are fabulous and I love your flowers and ribbon. So cute. 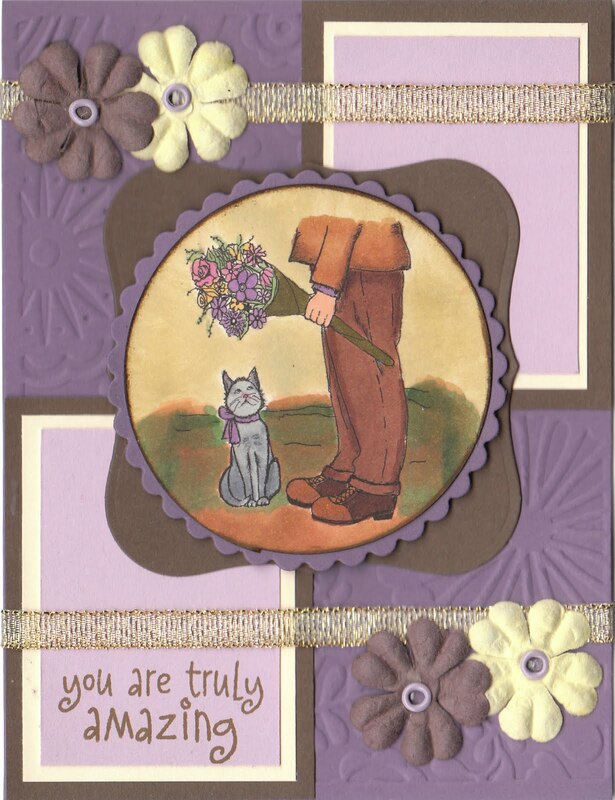 Dori, just love your coloring on this fabulous image and the color scheme you went with is perfect! Thanks so much for joining us for this week's Midnight Madness Sketch Challenge, I hope you will come back and play along with us again next week! What a great image! Lovely card! Thanks for playing the Color Throwdown! What a sweet card, thanks for playing along with Fab N Funky!